December 19, 2014 / Guy Widman / Comments Off on A Visit Down Under! Australia? What comes to mind: Long flight, BBQs ,crocodiles, surfing? My list could go on forever! But for some unknown reason Australia has never really appeared on my ‘bucket list’ of places I wanted to visit. When I was given the opportunity to visit New South Wales in November 2014, I jumped at it, and that was probably one of the best decisions I ever made. In one very jam-packed week I would discover just a sprinkling of what New South Wales could offer and find my opinions changed for good! 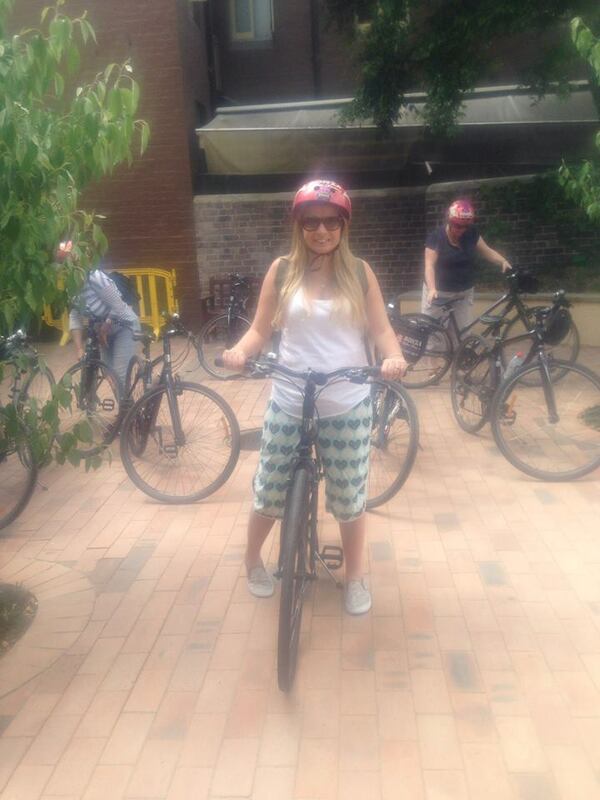 I have explored Sydney by foot, I have explored Sydney by boat and I have explored Sydney by bike! Each one giving me a different view on a very engrossing city. The clean, fresh and vibrant atmosphere really stood out to me from day one setting Sydney apart from other major cities I have visited. Regardless of which location you chose to stay in, the city is very accessible by foot; they are even currently doing some quite major building work which enable people to walk from Darling Harbour right around to Circular quay on the waters edge. There are endless choices of accommodation, catering for everyone. The Four Points by Sheraton boasts beautiful views from a number of rooms out over Darling Harbour, with a clean fresh look. Old Sydney Holiday Inn is well located between the Opera House and the Harbour Bridge, with amazing views from their rooftop pool. QT Sydney is very central and has a quirky, contemporary feel, set in an old state theatre building. This was my favourite of the hotels I visited and the amazing hotel restaurant is a must visit! The Sydney Opera House, one of the most iconic buildings in the world and the heart of Sydney. I was apprehensive about the Opera House tour initially (having never been to an Opera in my life!) but the hour long walkthrough is actually really interesting and the inside of the building is even more beautiful than its more famous exterior. The tour is around one hour, with food and drinks available afterwards in the very trendy, outdoor Opera Bar. Darling Harbour, this is definitely worth a visit during the day but it comes alive in the evening! Filled with bars and restaurants but equally catering to families with a firework display most Saturday nights. How awesome is that?! The city offers so much to do, whether it be a luxury cruise or a trip to Taronga Zoo to see the Koala bears. 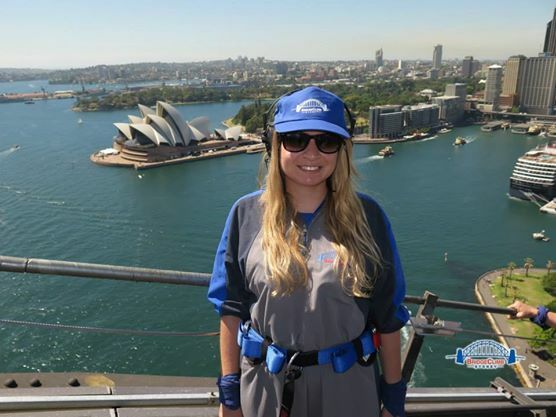 Without a shadow of a doubt, my highlight of Sydney was climbing the Harbour Bridge! I am not exactly a fan of heights but the excitement and adrenaline of doing the climb meant the fears never crossed my mind once. The hardest or maybe scariest part is climbing the ladders up to the bridge but once you are up there it really is a gentle walk (albeit at a few hundred feet above water) not the steep incline I was expecting. The whole experience is so surreal I don’t think you really realise how high up you are until you are back at the bottom again. Its truly amazing, with 360-degree views of the city it is an experience I will never forget. 24 hour flight, second tour of the day, still smiling! There is still so much to see in New South Wales outside of Sydney. We visited Port Stephens, one of the most popular weekend getaways for Sydney residents, and if the locals go, you know its good. 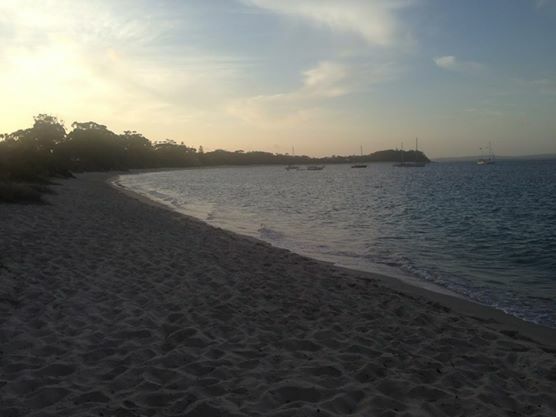 White sand beaches, crystal clear water, fab marinas. If you have never seen a dolphin in the wild I would recommend you do the cruise, I saw them – that was a tick on the bucket list. Port Stephens offers something for everyone. We did a sand dune experience exploring the miles of sand by 4WD or quad bikes, and having a go at the sand boarding is a must (I checked my travel insurance first!). The Ramada Shoal Bay Resort is positioned right on the beachfront. The complex has a mixture of rooms and apartments, which are a great self catering option for families allowing you to explore all the amazing local restaurants. I visited The Anchorage, a recently refurbished boutique style hotel with a nautical theme and amazing views right across the bay. This is a great place for a short stint of luxury, suitable for couples or families. A beach in the Caribbean? No, this is Port Stephens! The next stop was the Blue Mountains – I do enjoy countryside and I appreciate scenery, so this place I was very excited about visiting. It canbequite easily done in a day trip from Sydney, but I really recommend taking some time out here and staying at least one night. We stayed at Lilianfels, a hotel with a very English countryside twist including tennis courts and two swimming pools so a perfect place to relax in the afternoon after a morning of exploring. It caters well for both families and couples. While in the Blue Mountains we visited Scenic World, the home of the worlds steepest passenger railway (almost vertical at time!) and a sky way, which is similar to a vertical cable car 270 meters above the ground. All this is set in the middle of a Jurassic Park style natural rainforest with plenty of walkways to explore at your own leisure. Word of warning, this place can get reallybusy, especially over the local holidays, so plan when you are going to visit, either first thing or later afternoon when the day trippers have gone – but make sure you go and bring the whole family. Hunter Valley, famous for its wineries but also know as the playground of Sydney. You can do hot air balloon rides above the vineyards, hire bikes and segways or go to one of the 120 wineries for an afternoon tasting some of Australia’s finest exports! This place is great for a few nights of relaxation, and if you stay here it means everyone can try the wine. Peppers Guest House offers a small boutique style hotel where you can eat breakfast and watch all the wild kangaroos just meters from you. The Crowne Plaza is a great choice for guests wanting a resort style hotel. There is a choice of either hotel rooms or self contained villas and apartments. There is an outdoor swimming, restaurants and children facilities in a great setting. I really did have such an amazing time in New South Wales, I have learnt Australia has so much more to offer than I ever imagined and I am already planning my next visit!